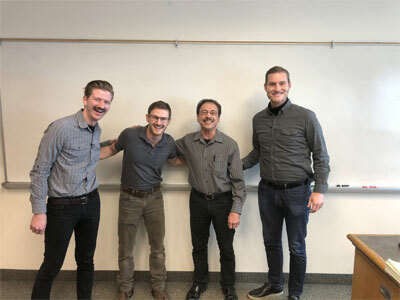 December 11, 2018 – Ian Wadsworth (left) is conducting research for his M.S. degree on encapsulating the drug quercetin in micelles to increase solubility and bio-availability. Quercetin is a plant pigment found in many plants and foods, such as green tea, apples, Ginkgo biloba, and St. John's wort with the ability to reduce inflammation, act as an anti-cancer agent, boost the immune system, and reduce histamines. Ian Wadsworth, Kyle Hillman, Ron Sims and Matthew Clegg. Kyle Hillman (second from the left) is conducting research for his M.S. degree on the treatment of toxins produced by harmful blooms of blue-green algae (cyanobacteria) or "pond scum" using microbes that are active in the absence of oxygen (anaerobes). Professor Ron Sims (second from the right) is the Instructor of Record for the senior/graduate level course Biochemical Engineering and is the Co-Director of the Sustainable Waste-to-Bioproducts Engineering Center. And Matthew Clegg (right) is conducting research for his M.S. degree addressing loss of muscle tissue (atrophy) during space flight by using suspended spider and silkworm silks in a three dimensional structure that can be used for testing and analysis of biological changes that affect muscle tissue. Ian, Kyle, and Matthew are scheduled to graduate in 2019.